Fisherman with long beard stends on the river bank with fishing rods. The man looks into the distance, covering his eyes with his hand from the sun. Slow motion. Lonely fisherman with long beard walks on the river bank with fishing rods. The man looks into the distance, covering his eyes with his hand from the sun. Slow motion. Lonely fisherman with long beard walks on the river bank with fishing rods. Slow motion. Bearded fisherman with long beard walks on the river bank with fishing rods. Slow motion. Happy smiling fisherman with long beard walks on the river bank with fishing rods. Slow motion. 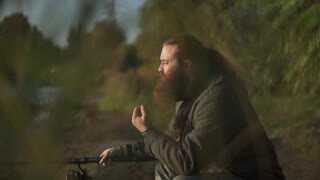 Man sitting with a fishing rod and scratches his beard. Fisherman relaxed outdoors. Bearded man fishing with fishing rod standing on the bank of the river. Fisherman throws the rod into the river. River fishing. Bearded man fishing with a fishing rod, leaves his rod on the river bank and walks away. Fisher is engaged in a hobby. Bearded fisherman fishing on the river. Fisher stands on the river bank with the rod. Fisherman throws the rod into the river. Bearded fisher fishing with fishing rod standing on the bank of the river. River fishing. Fisherman with long beard fishing on the river bank. Fisher strokes his beard. River fishing.